This is Join Us in France Episode 214. Bonjour, I’m Annie and Join Us in France is the podcast where we talk about France, its many quirks, its history, its language, and of course, itineraries and destinations in France you want to hear about because, hopefully, you’ll be visiting soon. 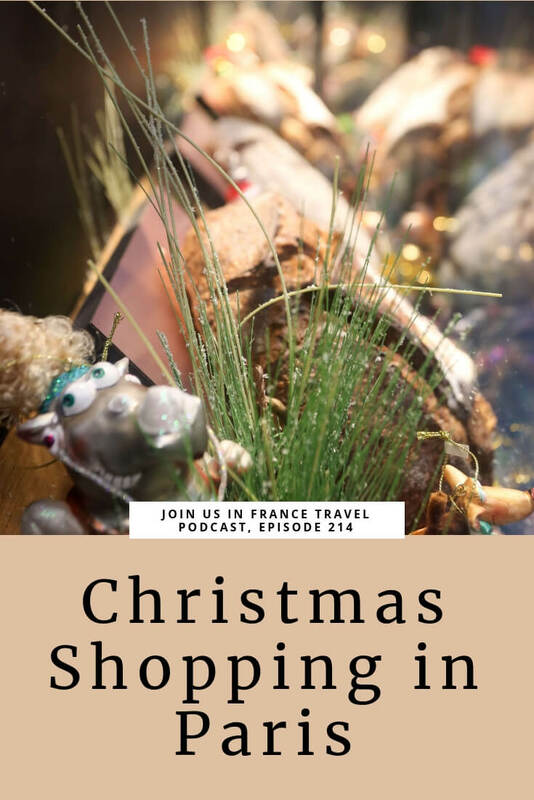 On today’s episode, Christmas Shopping and how to enjoy the Christmas season in Paris. I’m in Paris right now and I’ve enjoyed a few of these activities, I just HAD to share with my listeners! I’ll list the Christmas markets, the best department stores and covered passages at the Christmas season. In this episode you’ll also learn about where you can go see a beautiful Crêche (nativity scene), Christmas Concerts in Paris and Midnight Mass at Notre Dame. But where do you go to see Christmas lights and decorations in Paris? There are some everywhere, but here are my favorites. There is no Christmas Market on the Champs Elysées this year. Marcel Campon the master carnival organizer in Paris got in the cross-hairs of the Mayor of Paris Mme Hidalgo and President Macron too. Where did the Champs Elysées Christmas Market moved to? Not very far! It’s on the other side of Place de la Concorde along the Jardin des Tuilleries on the Rue de Rivoli side. Now it’s called Tuileries Christmas Market. It was morning when I walked by, so everything was closed. But I’m pretty sure it’s the same not very classy, not very interesting mish-mash of over-priced French food, mulled wine served in pint-sized plastic glasses, ornaments from China, and imported berets. It’s fine for an hour, but I wouldn’t travel great distances just for that. Christmas Market at Beaubourg, this is around the famous Beaubourg Museum in the Marais. There are around 50 chalets, activities for the kids, places to buy Christmas Trees and more. You’ll find a similar Christmas Market under the Canopy at Les Halles. This is at the entrance of a major and pretty nice underground shopping mall, they added a touch of Christmas on the surface. Since the Mayor of Paris booted the Christmas Market on the Champs Elysées she invited some Christmas attractions to the big plaza in front of the Mairie de Paris. Not a lot there, mostly activities for the kids from what I understand, but if you’re walking by, why not? Near Notre Dame, on Square Viviani (right by Shakespeare & Company). It’s small but it’s supposed to be nice. Saint-Germain-des-Près has a small Christmas Market around the Saint-Germain-des-Près church right by the metro stop by the same name. It’s small but charming. Christmas Market place des Abbesses in Montmartre, not huge, but cute, and if you’re in Montmatre anyways, make sure to make your way to Place des Abbesses. La Défense Christmas Market: this one is out of the way for most visitors and not particularly different from all the other ones, but again if you’re in the area or work there and are on a lunch break, why not? All the other Christmas Markets that will pop up in various neighborhoods around Paris. They are normally only there for a few days during the Christmas season so I can’t name them all. But you may run into something fun as you walk around Paris. There are Christmas decorations and stores all over Paris, but this is where they are concentrated. Galleries Lafayettes Boulevard Haussmann: this is THE one you have to go see. The main event is the giant Christmas Tree in the center of the store. It’s different every year and gorgeous. Bon Marché (24 Rue de Sèvres). Despite its name, this is not a cheap department store, but the products are top-notch and the decorations lovely. Really creative decorations most years. Les Halles Mall, the biggest shopping Mall in Paris and more approachable prices than in the Department Stores I named above. The Mall at the Louvre called Carousel du Louvre: nice, classy, and as a visitor I suspect you’ll be in the area at some point. Place Vendôme, when you’re tired of the plasticky stuff on the Christmas Market in the Jardin des Tuileries, make your way down rue de Rivoli and to the Place Vendôme. Classy and understated on one of the most expensive plazas in Paris. For those of you who like to venture out a little, Bercy Village is lovely. It’s an outdoor mall that gets a nice Christmas feel to it. BVH in Le Marais, really close to the Mairie de Paris, it looks lovely and the prices are in the middle class range. In the Bourse-Opéra-Grands Boulevards there are 3 covered passages that are all lined up in a row. 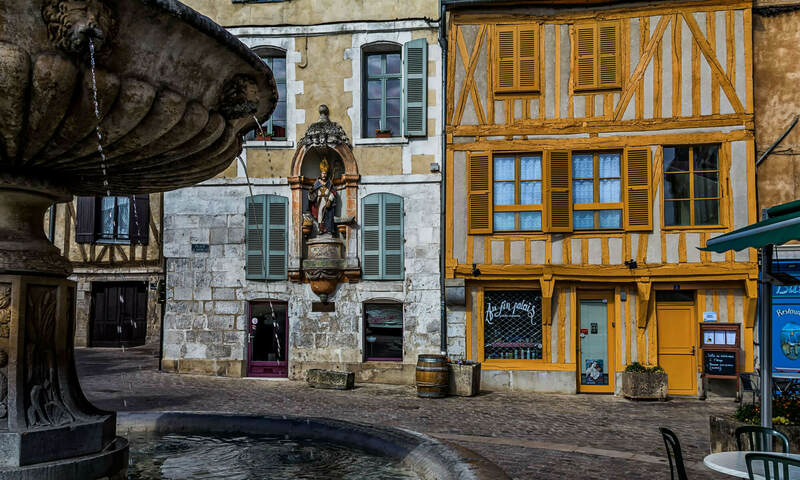 They are incredibly popular with French people because these are places where you can find unique gifts. The whole Bourse-Opéra-Grands Boulevards area has great shopping streets. And the 3 covered markets there are really good. Not all covered markets are great. These 3, yes, wonderful, well-worth a visit especially leading up to Christmas. I saw a shop that makes custom canes, you know, walking canes for older folks with mobility issues? Those were gorgeous! There are several book stores, most sell old and rare books. There are also flower shops, cafés, wine stores, vintage clothing, stores for collectors (stamps and more), toy stores, stores that sell decorative item. Not a single one was a brand you’d recognize, at least no brands you’d find everywhere in the world in shopping malls. These are one-of-a-kind stores. There were so many people there I had a hard time seeing all the stuff. I you can avoid going on a Saturday or Sunday you’ll be glad you did because they are mobbed. My niece and I started with passage Panoramas, skipped Jouffroy just across the street because it looked too full, then went to passage Verdeau. But you can do it in any order you wish. If you’re in the Galleries Lafayette / Printemps area, start with Panoramas and if you’re in the Palais Royal area start with Vivienne. The whole area is wonderful to explore. Put on your rain coat and look around! And for more information about the Covered Passages in Paris, listen to Episode 29 called Explore the Covered Passages in Paris. I will just mention the more notable ones, there are lots more that won’t make the list. 1. This year, 2018, and I’m not sure if they do this every year, the church near Buttes Chaumont called Église Saint-jean Baptiste de Belleville is putting on a collection of crêches and miniature Biblical scenes. It’s out of the way, but sounds like a cool event. 2. Crêche at La Madeleine: much more central. A different contemporary crèche is created every year and presented at this church. I haven’t seen it but it’s supposed to be lovely. 3. Notre Dame de Paris displays a lovely crêche each year put on by volunteers from Arles, the city of Christmas Santons. Make sure you look around for it, it’s a huge church! 4. Notre Dame has Christmas Mass on Dec 24 at 4:30 PM, 6 PM, 8 PM, 11 PM and Midnight. On Christmas Day they have mass at 8:30 AM, 10 AM, 11:30 AM, 12:45 PM and 6:30 PM. 5. The American Church in Paris also has services and sing-alongs, check their website for details. Thank you Paul Reid, Joe Scott, Rod Cummings, Blaire Skinner, and Isabel Mountbatten for pledging to support the show on Patreon this week! And thank you Tammy Medeiros for adjusting your pledge up, very nice of you! And my thanks also to all the other patrons who support the show month after month, thank you for giving back! To support the show on Patreon, go to PATREON.COM/JOINUS and you guys rock! All right, I refrained from talking about this last week because I don’t want to talk politics on the show, but there’s been several questions about the gilet jaunes, and it ties into French culture, so let me explain. Gas is super expensive in France. Imagine paying $6.44 per gallon in the US, that’s how much we pay on average in France right now. It’s gone up a lot especially for people who own diesel cars. Last year I paid $5.80 per gallon for gazole, so it’s a 12% increase in 1 year. And much of that increase has to do with increase in taxes. People are not happy about that, who would be?! Why such a steep increase? Because President Macron wants to incentivize people away from diesel cars that pollute more than unleaded gasoline cars. This is the opposite to what previous French Presidents have done. So, Macron raised the taxes on diesel gas very quickly. Today in Le Monde they were suggesting that a solution could be switching to a kerosene tax that would impact air travel but not the poorest folks who drive but don’t fly. Maybe, time will tell. Gilets Jaunes: There’s no way to know how long these protests will go on. Typically protests in France are organized. There is a designated leader who meets with the authorities and gets permits to protest, announces dates, etc. This was started by a long-haul trucker on Facebook who called people to put on the yellow jacket and make a pain of themselves anywhere they wanted to. No meetings, no permits, completely random. Anybody who doesn’t like Macron joined no matter what their beef with him was. In Paris on Saturday they were chanting “Macron tête de con” which means Macron stupid head”. In French it’s the perfect 3rd grader insult because it rhymes! French Presidents always have horrible approval ratings. All of them, no exception. So, that’s not new. And it’s not surprising when they riot in the 8th arrondissement and on Place de la République. But on the Champs Elysées? That was new! I don’t know when the protest will stop (French people are extremely patient with protests even if they don’t agree, polls today were saying 75% of French people support their right to protest) but I think security measures will get better. When this sort of protest happens in Paris they always close metro stations and re-route bus routes. So, the best thing to do is plan on walking. That’s what we did on Sat, Dec 1st, 2018. We saw lots of protestors, even saw some heavy black smoke and saw dozens of fire and police vehicles rush by. We walked in the other direction. That’s what I recommend you do if you’re in Paris when there are protests of any sort. This will blow over eventually, but it’ll take some weeks because like I said all sorts of discontented people are joining in a movement without a head or a direction. Does that mean that France is going to hell in a hand-basket? No, this is normal for France. If it wasn’t this it would be something else. So don’t worry, be happy! One last one: “I just arrived back from a week and a half trip around France. Thanks so much to this group and Annie and Elyse for their wealth of knowledge they provide in the podcasts. Thanks to Annie, when I saw the yellow jackets protesting in the south of France, I knew it was just part of the experience of being in France. I had been prepping for the trip for a few months listening to podcast episode after episode on a daily basis. So helpful! France was beautiful as were its people. Everyone we interacted with was very patient with our minimal French, but we always made it work – communication happened! The trip was unforgettable. I cannot wait to start planning my return to France. To connect with me, email annie@joinusinfrance.com, or leave a message at 1-801-806-1015. You can also ask to join the Join Us in France Closed Group on Facebook, when you do, please answer the questions so I know you’re not a spammer. Have a great week of trip planning and I’ll talk to you next week! Au revoir!